December was a quiet month for the experiment - not many fireworks to end the year. Although my portfolio did reach yet another record loss at -85%, it only ticked down one percentage point from the previous month. For comparison, the Dow Jones lost over -6% in December. Finally tally for the year: I am now down -85% on my Top Ten crypto portfolio since the beginning of the year. My $1,000 investment on the 1st of January 2018 is now worth $151. December Winners - It was a nice change to see a bit of green on my spreadsheet for the last month of the year. Winners: Ethereum and IOTAup an impressive 39% and 30% respectively. Litecoin ticked up 5% as well. December Losers - Stellar had an uncharacteristically rough month, losing about 1/3 of its value in December. More predictably NEM, which has been a regular cellar-dweller for many of my monthly reports, fared poorly, down -15% in December. 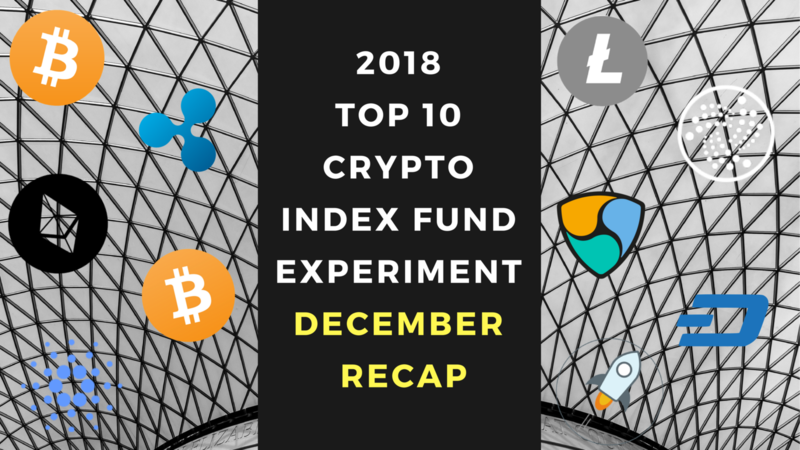 FINAL RESULTS for 2018 – Stellar wins the experiment followed by Bitcoin. Cardano and Bitcoin Cash in virtual tie for worst performance of the year. Even though Stellar had a rough December, it still ended the experiment solidly in first place followed fairly closely by Bitcoin. This is not a surprise to anyone who's been following the experiment - Stellar has been consistently one of the best performing cryptos each time I report. Stellar's victory is definitely Pyrrhic, as "winning" 2018 meant losing -66% of its value since January 1st, 2018. Second place Bitcoin? Down -71% on the year. If that's victory, what's defeat? Defeat is Cardano and Bitcoin Cash, virtually tied at -94% on the year. For the record, Cardano did slightly worse: my $100 invested in Cardano is now worth $5.97 and my $100 invested in Bitcoin Cash $6.32. Cardano and Bitcoin Cash are closely followed by NEM and Dash, and all four are members of the "Down Over -90% Club." IOTA's strong December helped it narrowly avoid this distinction as it is now down "only" -89% for the year. Summary: best performer of 2018 is down -66%, worst performers down -94% and 4 out of 10 cryptos that started 2018 in the Top Ten have lost over 90% of their value. I'll just let that sink in for a while. Interestingly, the Top Four ended up in the same top positions after 365 days. On the other hand, NEM, Dash, IOTA, and Cardano are Top Ten dropouts - they have been replaced by EOS (now at #5), Tether (currently at #8), Bitcoin SV (currently at #9), and Tron (currently at #10). December was basically flat, as the total market cap for crypto hovered right around $130B. A nice little pause from four consecutive record low month-end points since the end of August. 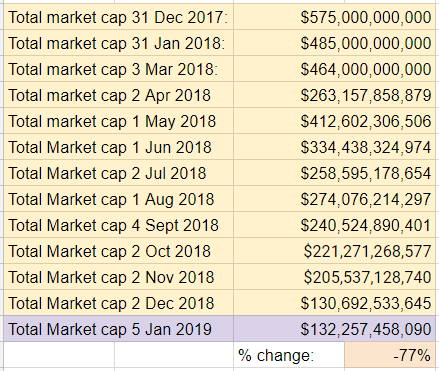 Final figure: the total market cap for crypto dropped -77% in 2018. Looking back, March was the worst month of the year in terms of both overall amount and percentage loss. Best month-end figure was end of January at $485B. Bitcoin dominance dropped slightly from the month-end record highs at the end of October and November, but it's basically been holding steady since the end of August, right around the 50% mark. 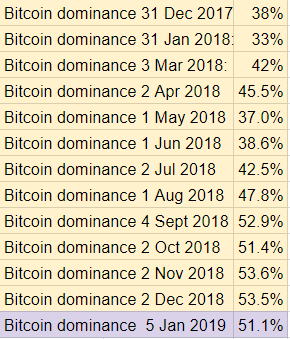 Too early to tell if the slight drop from 53% to 51% Bitcoin dominance from November to December indicates that buyers are looking at more risky alt-coins, we'll have to wait a bit to see if/how that plays out. As we've seen this throughout the experiment, when the overall market dives, BTC's dominance increases. If I wrapped up my experiment and cashed out today, my $1000 initial investment would return $151.81, down -85%. The numbers back up what all who were even remotely paying attention to crypto this year noticed: 2018 was not 2017. Beginning 2018 at all time highs put this experiment in a difficult position from the start and I was never able to come close to just breaking even - my "best" month was end of January where I was "only" down -20%. 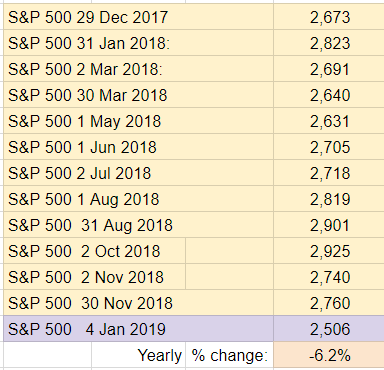 That said, buying mid-January when prices were even higher would have been worse - hard to imagine considering my Top Ten buys on New Years Day have seen a -85% drop - but yes, it could have been even worse. Congratulations to Stellar who outperformed its peers in 2018 and was consistently among the monthly top performers. Focusing solely on holding the Top Ten was a losing strategy. While the overall market is down -77% from January, the cryptos that began 2018 in the Top Ten are down -85% over the same period of time. At no point in the experiment has this investment strategy worked: the initial Top Ten continue to under-perform compared to the market overall. The 8% difference is significant, but it has shrunk a bit - it was as wide as a 12% difference at one point during the year (September). I also tracked the S&P 500 as part of my experiment to have a comparison point with other popular investments options. After a relatively strong year, the S & P 500 tanked in December, finishing down -6.2% on the year. Had I redirected my $1k investment to the S&P, I would have lost about -$62 on the year. Tough year for crypto, to say the least. The year end question is the same one we've been asking all year: is there more room to fall or have we finally hit the bottom for crypto? Thanks for reading and the support for the experiment. I hope you’ve found it helpful. There's no way I'm selling now at such a loss. Therefore, I'll continue to hold and will report on the Top Ten cryptos of 2018 as I've been doing. 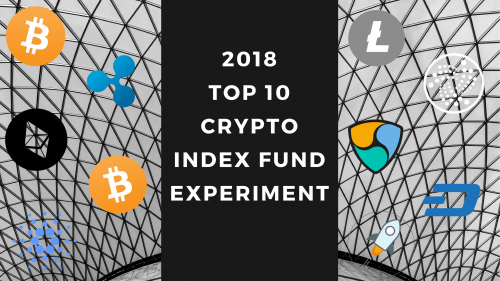 I've also decided to repeat the experiment with the Top Ten cryptos of 2019. On the 1st of January 2019, I purchased $100 worth of the Top Ten: Bitcoin, Ripple, Ethereum, Bitcoin Cash, EOS, Stellar, Tether, Litecoin, Bitcoin SV, and Tron. 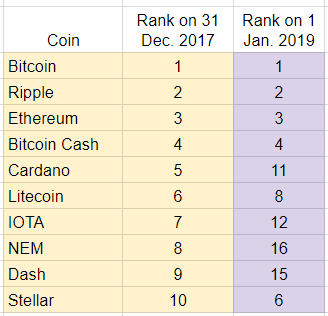 I honestly wasn't very enthusiastic to buy $100 worth of some of these coins, but I think it will be interesting to compare the Top Ten of 2018 with the Top Ten of 2019 to see how they compare. I'll share the results regularly - I'm aiming for monthly, as I did in 2018. So - I continue to be committed to seeing this process through and reporting along the way. Feel free to reach out with any questions and stay tuned for progress reports.